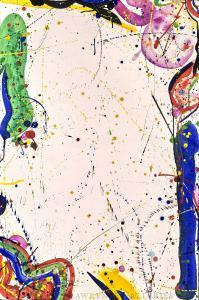 Sam Francis was an American painter, printmaker, and icon. Born in Northern California in 1923, he attended the University of California at Berkeley before leaving to join the Army Air Corps in 1943. 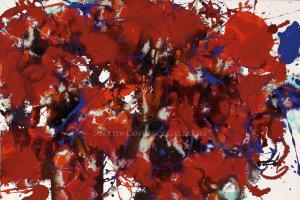 While recuperating from injuries suffered during his service, Francis began to paint. By the late 1940s, Francis was studying at the California School of Fine Arts (now the San Francisco Art Institute) and UC Berkeley, where he earned bachelor's and master's degrees. Curiosity and desire led the artist to Paris in the early '50s, where he attended the Atelier Fernand Léger and was exposed to the work of Pierre Bonnard and Henri Matisse, which ignited his interest in light and vibrant color. Francis achieved commercial and critical success with his large, paint-splattered, colorful images and, due to travels to the south of France, Tokyo, Mexico City, Bern, and New York, his artistic development reflected modern French painting, Asian culture and Zen Buddhism in particular. His paintings of the 1950s evolved from monochromatic abstractions to massive richly colored murals and "open" paintings that feature large areas of whiteness. After his 1953 painting "Big Red" was included in the 1956 exhibition "Twelve Artists" at the Museum of Modern Art in New York, Francis enjoyed a rapid rise to international prominence. MLG Soho is exceptionally proud to offer collectors archetypal Francis works and images. These include mandalas, trellises, and spirals, which dominated his work during a period in the ‘70s when he immersed himself in the work of Swiss psychologist, Carl Jung. In Jung's writings, Francis discovered ideas which he instinctively believed to be true, and which he believed he had been exhibiting in his work from the start. Francis' works of the early 1970s have been referred to as ‘Fresh Air pictures’ which he created by adding pools, drips, and splatters of color to wet bands of paint applied with a roller. These works reasserted the artist's interest in color. 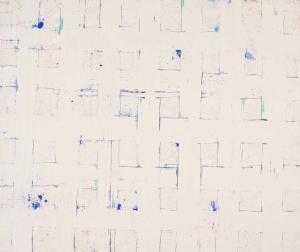 By 1973–4 Francis' paintings featured a regular grid or matrix made up of crossing tracks of color. Many of these matrix works were massive in scale, measuring up to twenty feet long. During the course of his career, Sam Francis was commissioned to paint many important murals, including those on exhibit at the Louvre Museum in Paris, the San Francisco Museum of Modern and the Kunsthalle in Basel, Switzerland. His first one-person exhibition was in Paris in 1952 and Francis sold his first painting to the Museum of Modern Art in New York in 1955. Retrospectives of his work have been held by the Houston Museum of Fine Arts, the Kunsthalle in Basel, Albright-Knox Art Gallery in Buffalo, Pompidou Centre in Paris, The Institute of Contemporary Art in Boston, The Museum of Modern Art in Toyama, Japan, Sweden's, Malmo Konsthall, Museo Nacional in Madrid, Galleria Communale in Rome and the Los Angeles Museum of Art. To Francis, the power of art lies not in its superficial effects, but in how it resonates in the soul. As he said, "Depth is all." Despite its simplicity of form, his art reflects an intense and thoughtful man. It is deeply personal, revealing the presence of a powerful and genuinely creative spirit.